I know, I know… incredibly philosophical stuff here. But, as I was savoring this particular artichoke at Cafe Cruz in the quaint town of Soquel near Santa Cruz, I realized that I had been eating artichokes the wrong way my entire life. Don’t get me wrong. I’ve had my share of grilled artichokes. I’ve even taken to making them myself at home…pretty darn proud of them too. But, Cafe Cruz has it figured out. 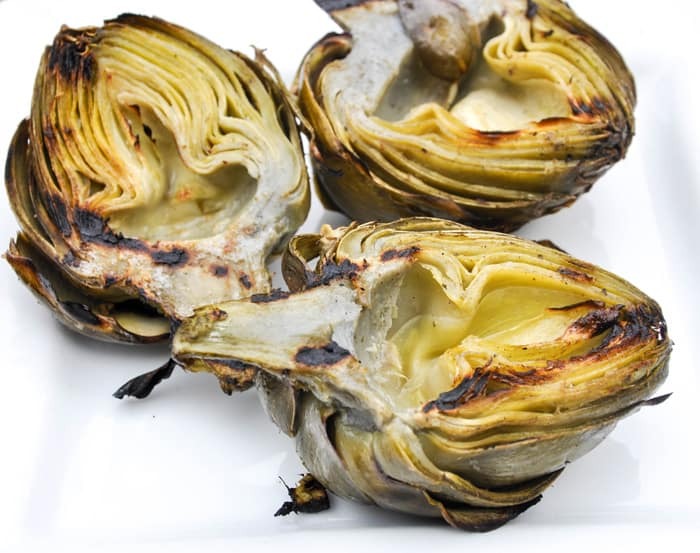 The smoky, grilled artichokes are first cooked in a salted oregano-cumin spice blend, allowing the delicious mixture to get into all the nooks and crannies of the leaves and crown, making each bite an aromatic adventure. As you release each tender leaf from the stem, tiny bits of herbs are easy to recognize as you dip into their spicy, house-made chipotle aioli. Not only are they committed to serving fresh, local produce, Cafe Cruz sources all of their protein from California producers. The artichokes in particular are direct from Pezzini Farms. Needless to say, the artichokes were the opening act to a wonderful lunch. For our second course, I selected the fresh Grilled Prawn and Three Beet Salad. 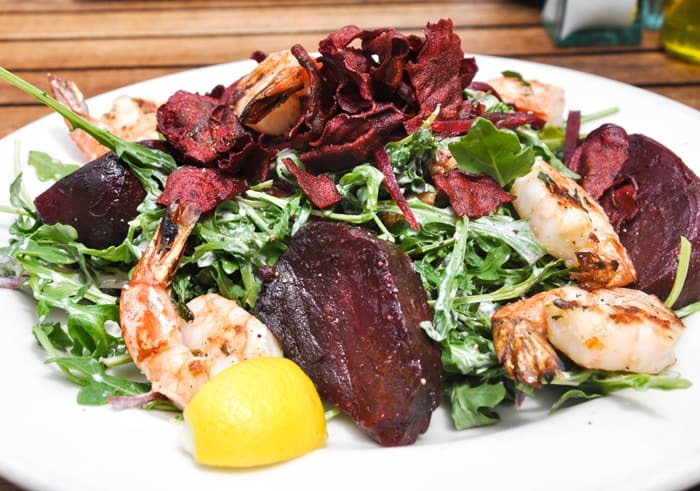 I was enticed by the description of the dish being served with three different versions of local beets all served atop a bed of dressed arugula. The prawns were perfectly cooked and the beet trio was the obvious winner. The fresh beet chips piled at the top were intense in flavor and crisp in texture and were a great substitute for the traditional crouton. Lastly, I couldn’t pass up the Calamari Steak Sandwich. Served on a toasted onion bun and layered with local veggies, this tower of freshness is a great choice if you are craving a seafood dish. The optional side of fruit balances the heartiness of the stacked sandwich. Cafe Cruz is conveniently located just off Highway 1 in Soquel near Santa Cruz. 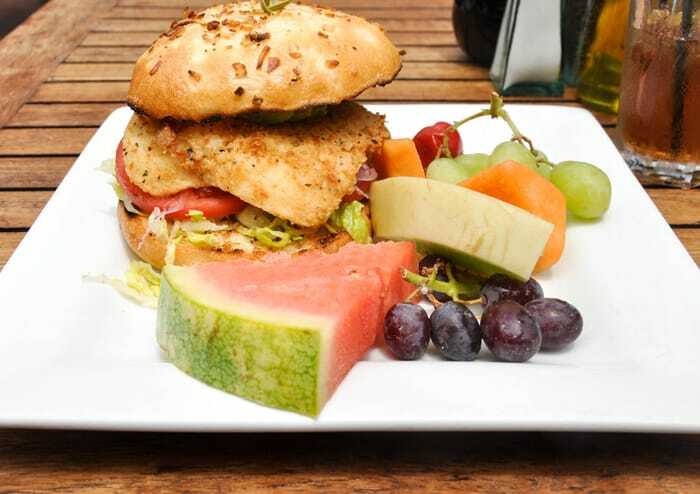 The kid-friendly, California casual cafe serves lunch and dinner and changes their menu seasonally to stay true to their local source philosophy. You can see more of their dishes HERE. Next time you are in the Santa Cruz area, make sure to treat yourself to this coastal treasure.